We all tend to fall into past from time to time. Yet, one has to know the proper ways to do so. Otherwise you risk to end up drooling over memories and missing the beauty of presence. One of the best ways to let yourself dive into the good old days for a while is to create a retro outfit. With such a look you are guaranteed to get into the atmosphere of past and still stay pretty tuned and on trend. Besides, retro outfits always looks very chic and elegant. There are much more advantages to this awesome style – if you are willing to get familiarized with them, scroll down and enjoy the charm of the loveliest looks ever. Bright shades are a signature element of the retro style. Especially when they are combined in a gorgeous way. Above is my favorite outfit from today’s set – I believe I am not the only one who fell for this saucy ensemble. The adorable collared A-fit mini dress looks absolutely stunning; yet, when it is designed in such an engaging color palette, it becomes absolutely impossible to fight its overwhelming power. Deep wine red is combined with vibrant pink; together the two colors create a cute pattern. The length of the frock is perfect to show off the beauty’s legs and cover what is necessary. I am in love with the magnificent pumps in pinkish-burgundy, stylish rust brown handbag, leopard gloves and trendy sunglasses that complement the outfit. This less vibrant outfit will also speak to many of you. It is impossible to not fall for the way this look is styled. Everything from the color combination to the silhouette is amazing. I would love to have this flare midi skirt with a unique and extremely beautiful design. It is even hard to find the right words to describe it. While most of the items today come in rather cliche floral, animal or striped prints, this is one is an exception. The striking skirt in beige and yellow is combined with a plain turtleneck in mustard. An elegant belt in gold, matching handbag and a pair of absolutely outstanding shoes in lemon complement the look. Here is a more moderate outfit for those of you who prefer simple designs. This is also the most casual look of all the presented ones, which is why it will gain love of many ladies as well. Every single woman needs a casual ensemble (or two) in her wardrobe; if you manage to make it one of the sauciest outfits in the world, be sure that the world is half yours. A lovely skater skirt with a high waist in carrot pink is paired with a cute light blue blouse featuring a bow and an appealing print. 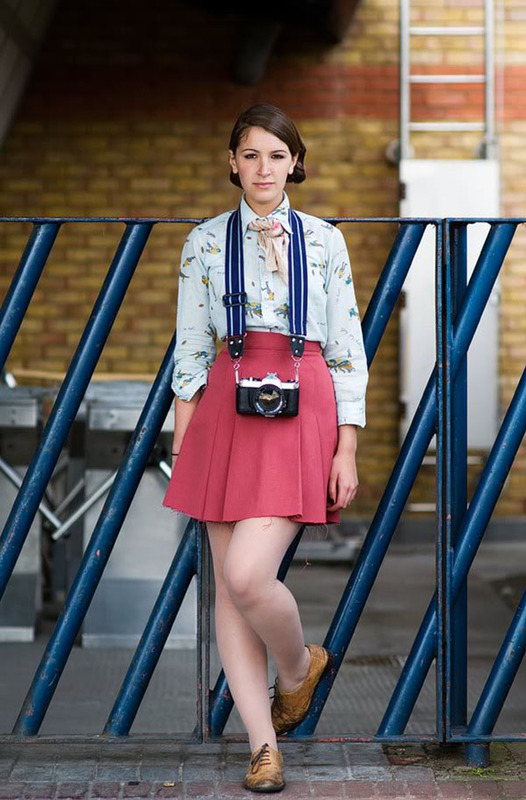 A pair of camel brown loafers along with a vintage photo camera add up to the retro side of this look. Another bright outfit for big fans of vibrant shades. In this case, it is a very bold and catchy combination, which by all means keep you in the spotlight all the time. I am absolutely in love with the delicious fuchsia coat with short sleeves and large buttons. The fit of the coat is quite interesting – you won’t spot any skimming hues or curved lines at all. Yet, this adds a unique zest to the ensemble and along with the coral pleated capri pants, gold ankle strap sandals, blue clutch and black sunglasses finish the outfit in an excellent way. Creative headwear is also a defining feature of the retro era. Since normally there are not so many outfits in our closet that feature a head piece, I would highly recommend to take into account this particular one. Black flare midi skirt with a high waist is complemented by a matching checkered blouse with white trimming. A very sophisticated chain bag in burgundy as well as the sauciest emerald green atlas pumps and exquisite earrings make this look even more alluring and irresistible. However, the main element is yet to come. A striking turban in glossy purple adds a very appealing zest to this outfit making it even harder to stay indifferent toward it. Last but not least comes a look for those ladies who prefer to rock pants. I like this pair a lot, as it seems to have its own character. 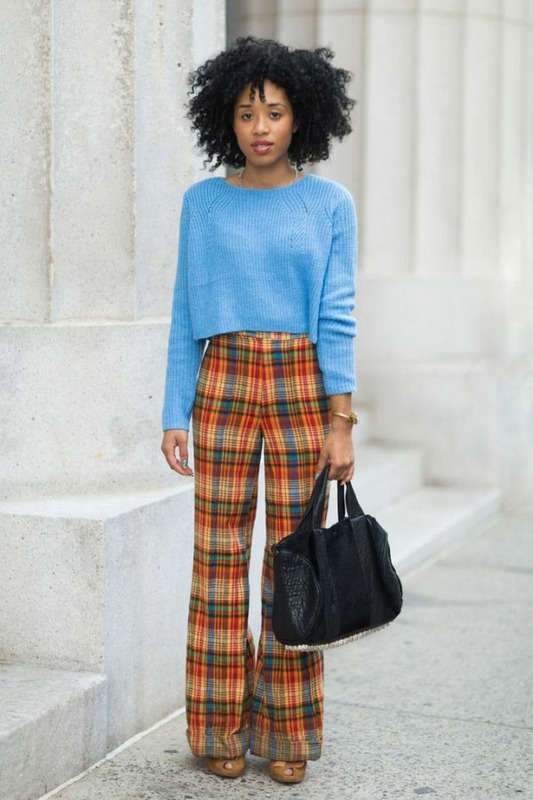 Pleated and colorful pants with a baggy silhouette perfectly go with the crop knit sweater in sky blue, pumps in cappuccino and a suede black handbag. These were the most awesome looks that are designed in retro style. Which one did you like the most?